WAIST HIGH: Happy 25th Birthday Labour Of Love. Happy 25th Birthday Labour Of Love. 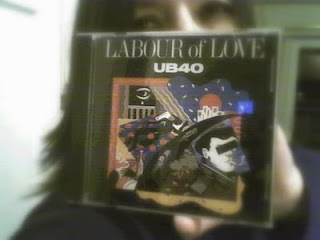 UB40's fifth studio album, the Waist High favorite Labour of Love, consists entirely of cover versions of songs originally released by the group's musical idols. The most notable track is the cover of Neil Diamond's "Red, Red Wine," which reached #1 in the UK upon its release. The song was re-released in the United States in 1988, where it also topped the chart. The album and 12" version included a toasted verse by Astro, later copied by Neil Diamond in his live performances. Other tracks include the greats "Keep On Moving," "Sweet Sensation," originally recorded by The Melodians, "Johnny Too Bad," "Guilty," and Jimmy Cliff's "Many Rivers To Cross." From the liner notes the band says the selection of songs "represent reggae when it was first called by that name. Reggae before it was discovered by cops, sociologists, and TV producers. Before it was claimed by the lefties, liberals, punks and rastas. Reggae when it was just the other dance music and most DJ's still sniggered at it." In 1989, Labour of Love was ranked #98 on Rolling Stone's list of the 100 greatest albums of the 1980s. The band would later release two more cover albums, Labour of Love II, and Labour of Love III.